Honestly, I don’t know how a garden grows, but I’ve been asking for help. My friend Valerie gave me some good advice. “It’s easy,” she said. “Just cut open a bag of potting soil and sow some arugula seeds in the bag. Instant garden.” Is it really that simple? Maybe I’ve been reading too many books. Books, please help my garden grow! Most of the books are helpful, but sometimes I get overwhelmed by the sheer bounty of things to plant, the ways to plant them, and my fear of garden failure. 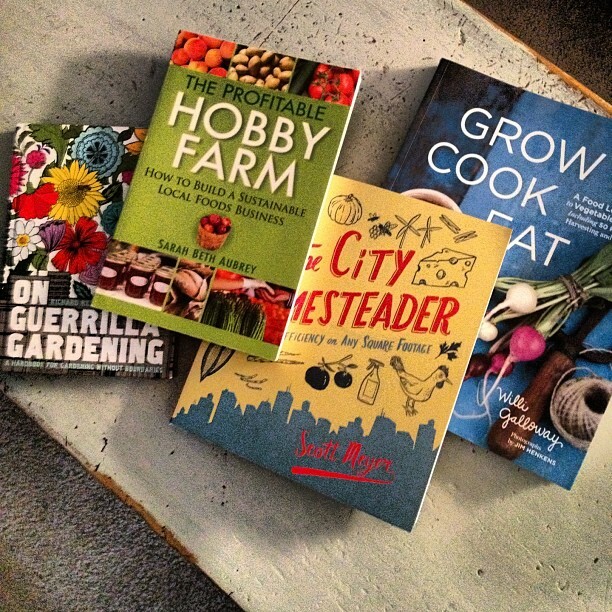 But in pursuit of all things local, I must have a garden, so I’m going to give it a whirl this weekend. My sad, little yard will play host to some type of very small (miniscule is more like it) vegetable plot. 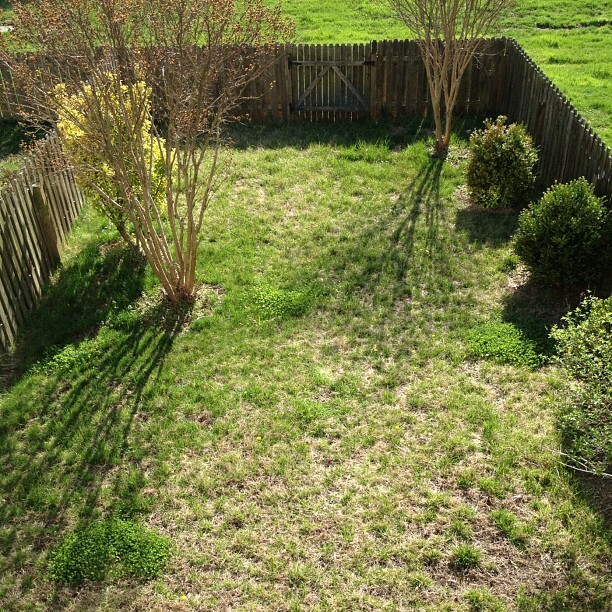 This yard doesn't look too promising a place for a garden, but I do get full sun mid-morning to evening. That's a good start! 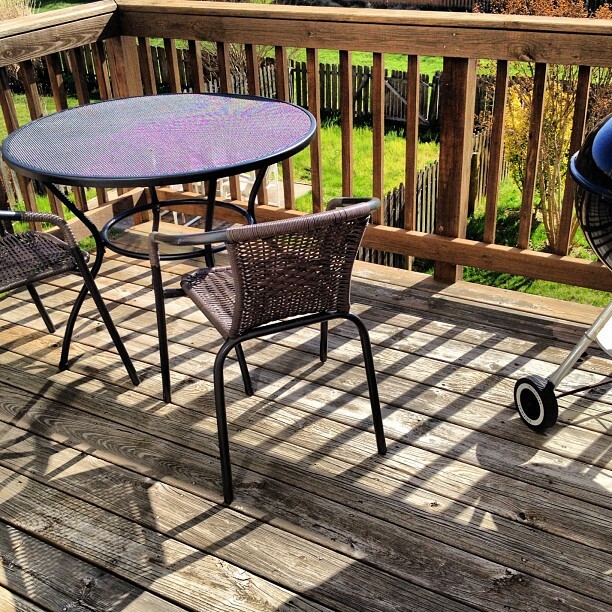 And my tiny deck will be the perfect spot for an herb container garden. Tips and advice are appreciated! Wish me luck! I look forward to enjoying some veggies fresh from your garden on my next visit ; ) I am also attempting a container herb garden this weekend…we can swap pics of our babies! Yes, we must! Good luck, Allie! I’m looking forward to a summer visit. If I were you, I would start with a few things first. Like tomatoes and peppers (both pretty easy to grow). Herbs are really easy too. What we don’t grow we get at the farmer’s market and preserve (freeze, can, etc). Then, next year add a few more veggies to your garden and buy less at the farmer’s market. That way you do not get overwhelmed in the beginning. We are doing the same thing with animals. We will be getting 5 chickens this year and 2 goats. Then, next year we will add a pig and a couple sheep. :o) That way we do not do too much at once. Chickens! Oh, how I want chickens! Some day. 🙂 Good luck with the animals, Jayde! Sounds like fun. I am interested in the arugula! My husband literally plopped a bag of soil and two seed packets in front of me – I have two little flower pots growing with herbs and cilantro – it is that easy! You can do it! I’ll let you know how it goes! I’m also going to grow cilantro–one of my favorites. You’re going to do wonderfully with the garden. That patch of dead/dry grass is the perfect spot for a garden. I’d remove the grass and then turn the soil and build up a bit with some bricks or some pressure treated wood, mix in some organic fertilizer and additional soil, and then get some plants in. Don’t be nervous and start with some basics: tomatoes, cucumbers, zucchini, and string beans. I’m sure you’ll be able to do it. Good Luck! Thanks for the great tips and the encouragement, Frankie! That positive energy makes me feel more confident already. 🙂 I’ll definitely be posting about how it goes.